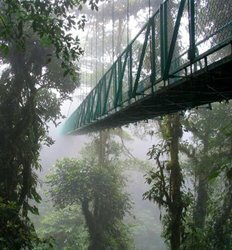 Monteverde is a major ecotourism destination in Costa Rica. Monteverde & Santa Elena cloud forest reserves attract naturalists and tourists from all over the world for its beauty and its unique eco-system. The Real Deal Tours brings you a unique way to experience the best the cloud forest region has to offer on one of our Overnight Monteverde Boat tours departing from San Jose. Escape the city and go from the sunny Gulf of Nicoya Islands to the mystical Monteverde cloud forest all on one spectacular excursion....it just does not get any better than this! 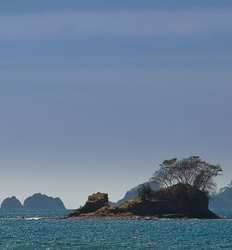 Nature lovers and history buffs will both enjoy the Gulf of Nicoya Islands and Monteverde Overnight Tour. The day first takes you bird-watching to the aptly named Bird Island, then exploring the eerie history behind the San Lucas Prison Island and finally to enjoy lunch on the sunny beaches of Jesusita Island. Top off your day with a comfortable stay in a relaxing accommodation nestled in the cloud forest and charge your batteries for the exciting nature tours in Monteverde the next day. Rather spend less time on board the boat and more time on the beach? 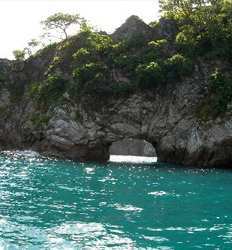 Honeymooners and beach lovers should choose the Tortuga Island and Monteverde Overnight Tour. Journey through a catamaran boat cruise along the Golf of Nicoya, enjoy the white sand beaches of Tortuga Island, and experience Monteverde's Cloud Forest from 8 various hanging bridges in a single breathtaking overnight adventure! Our overnight Monteverde boat tours departing from San Jose ensure you do not miss out on two of Costa Rica's most incredibly diverse destinations, even if you are short on time. Island hopping by day, dreaming nestled in the cloud forest at night and exploring the best of Monteverde from the famous cloud forest hanging bridges...need we say more?? Book your Island Hopping & Monteverde Overnight tour with the Real Deal Tours and know you are getting the best deals in Costa Rica!